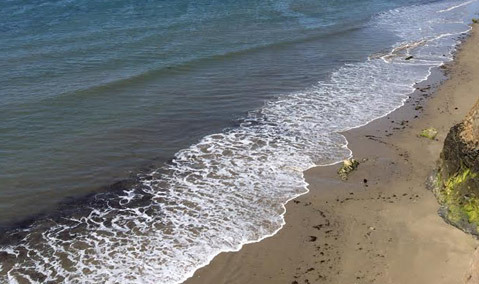 Isla Vista beach this morning showed a few more oil globs than usual. So far, the plovers at Coal Oil Point are safe. Santa Barbarans eager to help with the oil spill cleanup have been turned away repeatedly, with even the Environmental Defense Center’s Linda Krop saying citizens should stay away from Refugio and let the professionals handle the guck. Refugio and El Capitan beaches have been closed by the state — and Lake Cachuma sent out a notice that it had open spaces over the Memorial Day weekend. UCSB has closed access to Coal Oil Point both to protect the wildlife and to let responders have unfettered access. If oiled wildlife is found, the university advises, the best thing to do is call (877) 823-6926, which reaches UC Davis’s School of Veterinary Medicine’s Oiled Wildlife Care Network. Picking up an oiled bird can do more harm than good, the school said in a bulletin sent to students. According to the Coast Guard, more information on volunteering and training for the oiled wildlife network can be had at calspillwatch.dfg.ca.gov. Overall information on the Refugio spill is available at refugioresponse.com. The only call for volunteers that has gone out is from the Office of Oil Spill Prevention and Recovery, which seeks people who have already gone through CERT (Community Emergency Response Team) training for all-day Friday and Saturday events. They are asked to call Ima Doty at (916) 215-3858.